Finding a piece of chewing gum stuck to your carpet is a real annoyance, especially if you have a clean, new carpet. If left too long, that gum will turn into an ugly, grey blotch that makes your home look dirty and neglected. Removing gum from carpet isn’t as hard as you might think, though. As with most stains, gum is easier to remove when fresh, but even if it’s been there a while, you can still get that nasty, sticky stuff off your carpet completely. There are several approaches to cleaning up gum, so if one doesn’t get the job done, try another. Keep in mind that if your carpet is an antique or includes delicate fibers such as silk or alpaca, it’s best to consult a professional carpet cleaner before you try removing the gum yourself. This step could save you from permanently damaging your carpet. 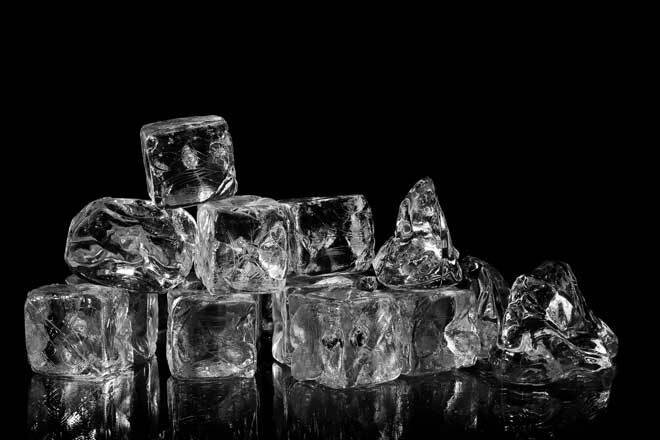 If you ever got gum in your hair as a kid, you might have experienced first-hand how freezing gum makes it easier to remove. The same method works on gum on the carpet, too. Sticky, gooey gum clings to carpet fibers and stretches when you pull on it, making it nearly impossible to remove. If you harden the gum, however, it loses its grip on the carpet fibers, so you can simply peel or scrape it off your carpet. Start by placing a single ice cube on top of the gum and leave it there for a full minute. This should be long enough to harden the gum. If it isn’t, fill a sandwich bag or other plastic bag with a few handfuls of ice. Place the ice-filled bag directly onto the gum. Leave it for around 15 minutes or until the gum turns hard. Once the gum has hardened, as long as it isn’t ground into the carpet, you might be able to simply peel it off by hand. Cover your hand with a plastic bag if you don’t have any rubber gloves. For more stubborn gum, use a scraping tool such as a windshield ice scraper, plastic spoon or old credit card. Avoid using a knife to remove the gum because you could cut the carpet fibers, leaving permanent visible damage. If the gum has left a stain or other discoloration on the carpet, spray the area with a household cleaner that’s safe for carpets. Apply a white cleaning cloth to the area and press. Continue to dab the area until the stain is removed. Use only a white cloth because the cleaner could cause the dye in a colored cloth to bleed and further stain your carpet. If freezing the stuck-on gum doesn’t give you any results, taking the opposite approach just might. By melting the gum, you’ll reduce its stickiness and make it soft enough to clean up. 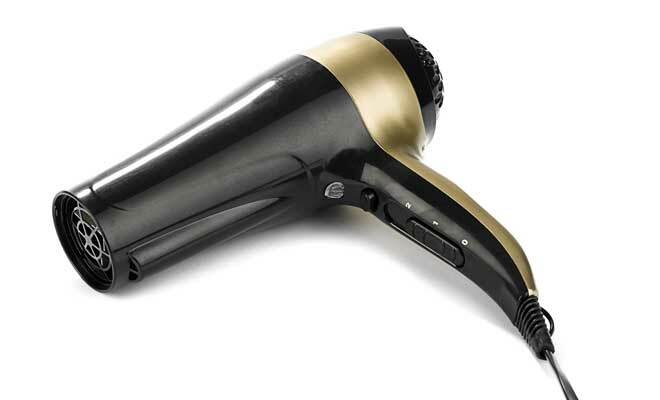 Before you start, have a hair dryer and a plastic bag or disposable cleaning cloth ready. To melt the gum, turn your hair dryer on low heat and aim it directly at the gum. Avoid using high heat and pay close attention because it shouldn’t take more than a minute or two to soften up the gum and too much heat can damage both natural and synthetic carpet fibers. Once the gum starts to melt, remove the heat and use the plastic bag to pull the gum off the carpet. The melted gum should stick to the plastic better than it does to the carpet. You might need to scrape gently to get all the gum off. If the gum starts to harden again, reapply heat. Use a sponge and plain water to remove any gum you couldn’t remove with the plastic bag. If any staining is left, follow the stain removal method outlined in the previous section. Freezing and melting tend to work best on freshly dropped gum that hasn’t been stepped on repeatedly and mashed into the carpet fibers. Older gum is more difficult to remove and often requires a solvent, such as a carpet cleaner. Because gum doesn’t dissolve in water, you’ll need an oil-based product to break down the gum enough that it can be removed from the carpet. If you aren’t able to find carpet cleaner, you can use another solvent or degreaser such as oil soap for wood, WD-40 or dry-clean stain remover. Muscle pain reliever creams and peanut butter are other alternatives. It might sound strange, but the oils in these products attract the natural gum base in the chewing gum, breaking it down so it can be pulled it away from the carpet fibers. Be aware, though, that some solvents not designed for use on carpets can damage carpet fibers or bleach the color out. Even peanut butter can leave a stain on some carpets. 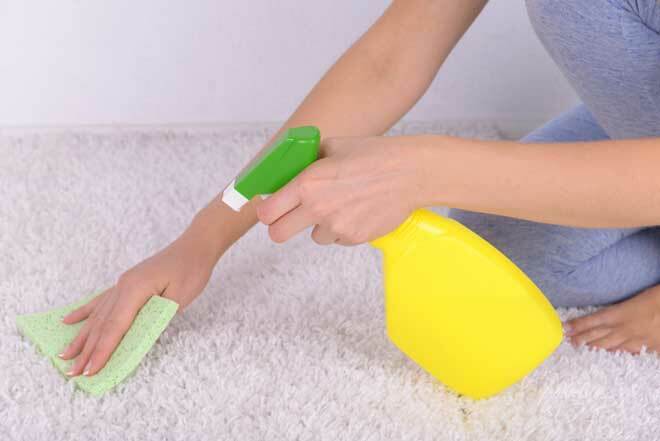 Before you try this method, spot test all cleaners and other substances you plan to use on an inconspicuous part of the carpet, such as inside a closet. Start by liberally applying your chosen solvent to the gum. Let the solvent soak in for 15 minutes. Using a fingernail brush, scrub the gum in one direction only, either away from you or toward you, but not both. Apply more solvent as necessary. This method will leave some gum in the carpet fibers, but you can remove this by applying more solvent or detergent to the area, and wiping it away with a damp sponge. Once you’ve got all the gum out, apply a solution of baking soda and white vinegar to the area you’ve just cleaned. This neutralizes any leftover acids from the cleaning products that could cause damage if left too long. It also helps remove the chemical smell of the cleaner. Gum stuck to your carpet is an unsightly nuisance, but in most cases it’s relatively easy to get rid of. Freezing the gum is the simplest method, but this works best on fresh gum. For gum that’s been ground in or stuck for a long period, applying a solvent is usually a more effective approach to cleaning. If gentle cleaning methods don’t get the gum out, consult a carpet cleaning professional before you move on to more aggressive methods.